I am a new starter with eScribe, so forgive me if I am being a bit thick. I have connected my Wismec Reuleaux DNA 200 Mod and all appears well. 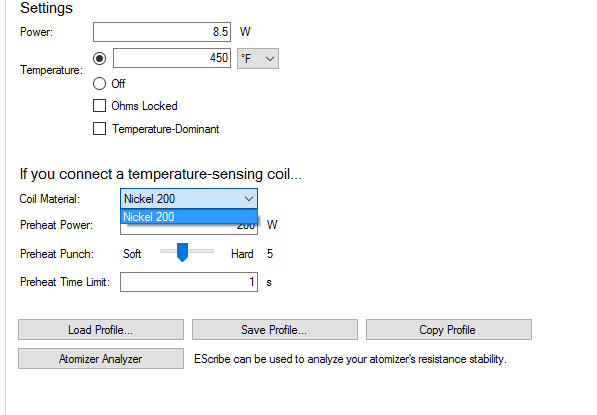 I was looking at creating a profile for my Uwell Crown SS316 coil, however, I do not get the "Custom.." option in the Custom Coil Material dropdown. All I get is Nickel. Am I missing something or just being really stupid? Am on mobile so cant tell you exactly, but there is amouther part of escribe if you tab through where the materials should be listed, if theyr not there i would re load the program..
You need to add it to your mod first in the list on the rhs of the materials tab. Perfect - thank you very much indeed for your help.